Question from one of our students: Is there any way to practice the mechanisms of the various organic reactions on this program? 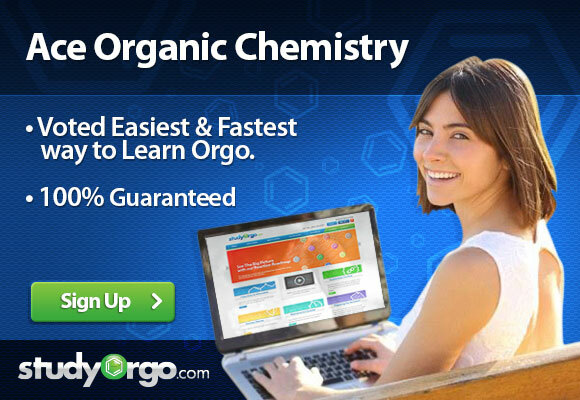 Answer from one of our StudyOrgo.com Experts: Thank you for your inquiry. Yes, our program highlights the key points about mechanisms in the reaction description sections of the flashcards. These are written under the heading of “Mechanism Hint.” Additionally, the full mechanisms for the reactions of SN1, SN2, E1, E2 can be found in the dedicated StudyChart: “SN1 SN2 E1 E2 Comparison Chart.” We do not write out the entire mechanism for each reaction because this information can be easily obtained in any standard organic chemistry textbook. Our materials present key tips, tricks and hints that textbooks and professors don’t tell you but can be very valuable for exams. Additionally, mechanisms are typically a small portion of any classroom exam and it would typically inefficient to try to memorize every single mechanism. Rather, you may want to learn the ones that your professor highlights. Our materials will help you understand the reactions and other topics that will be tested in a very thorough manner. Take time to learn each reaction in Study Mode, then practice what you learned by creating custom quizzes in our Quiz Mode. If you every have any questions, please do not hesitate to contact us at any time.